Today we had the third Flyweight world title bout inside a week and although it was the least interesting bout on paper it turned out to be the most competitive as Amnat Ruenroeng (14-0, 5) narrowly retained his IBF Flyweight title with a split decision over mandatory challenger McWilliams Arroyo (15-2, 13). The fight, like many, started slowly with both men trying to feel out the other. This slow pace suited Ruenroeng down to a tee as he pecked away with his jab and made the most of his long reach and quick hands. It wasn't so much that Ruenroeng won the round however as Arroyo did little to try and win it. After the slow opening round the bout slowly warmed up as Arroyo picked up the pace and forced Amnat to revert to a counter puncher through rounds 2,3 and 4. These were very competitive rounds though they all seemed to be the champions rounds, marginally, courtesy of the flashier and more eye catching combinations that he was landing after Arroyo landed heavier but single shots. It was a case of "what do the judges like?" though on quantity it was certainly the champion who appeared to be opening up a notable lead. The momentum shifted notable in round 5 as Ruenroeng began to look tired and and the determined challenger began having more and more success it was another close round though one that certainly seemed like an Arroyo round with Ruenroeng holding more and throwing much less. The shift towards Arroyo continued in round 6, his best round, as he dropped Ruenroeng hard just moments after being pushed over himself. On replay the knock down appeared slightly dubious though it was clear that Arroyo had the power to hurt Arroyo even if the show did look to be landed behind the head. Prior to the knockdown we had seen both men trading combinations in the stand out round of the fight. Despite being badly hurt in round 6 Ruenroeng bounced back in round 7 and looked like a man possessed, or like a man who had had some Kratingdaeng, and took the fight to Arroyo from the bell. Unfortunately it wasn't long before Ruenroeng began holding and spoiling the work of the challenger who looked determined though frustrated due to the tactics of Ruenroeng which won't have won him international fans though will have pleased those who came to see their man retain his title. From round 8 onwards both men began to look notably tired and struggled to get much clean and sustained offensive work between them. Arroyo went looking for hayemakers whilst Ruenroeng tied him up, wrestled him and generally tried to steal rounds in what was becoming a messy fight between tired men. For Arroyo however this seemed to help him as Ruenroeng's work rate continued to drop and he was trying to steal rounds on one or two bursts whilst Arroyo brought pressure throughout, most of was thwarted though the negativity of Ruenroeng didn't do him favours with the judges. Going into the championship rounds it appeared that Arroyo would need another knock down to have any chance of winning. That however never came as a tired Ruenroeng did enough to holding him self up, stall the action and, several times, take Arroyo down with him, including what appeared to be a professional wrestling move at one point. By the final bell both men appeared exhausted and didn't seem to know who had won. Fans on twitter seemed to feel Ruenroeng had done enough and although the judges w-ere split they too agreed that the Thai had just done enough to retain his belt with a split decision winning courtesy of scorecards that read 115-114, 114-113, 113-114. Cards that suggest they had several 10-10 rounds and acknowledging the possible lack of a clear winner in several rounds. 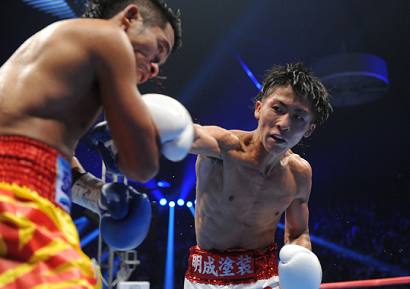 On the back of this performance Naoya Inoue will likely be hoping to get a fight with Ruenroeng later this year though Zou Shiming's team may also have seen the flaws with Ruenroeng that could give them hope of taking the IBF title early next year. Arroyo, for all his power and determination, didn't look like a world champion in the making and Ruenroeng didn't really resemble much of a world champion, with his holding and spoiling, in what was certainly a competitive but second tier world title bout at Flyweight. The two men who were in the ring here are a clear level below both Roman Gonzalez and Juan Francisco Estrada, though in fairness Gonzalez and Estrada are elite level fighters in the best division in the sport.